Wild horses, running free. Click here to play! It's an image that has appealed to the adventurous spirit inside of us all at one point or another. The Free Spirit Wheel of Wealth slots are based on that desire to roam free, which is why they feature wild horses and a jackpot big enough to make a real difference in an average person's life. 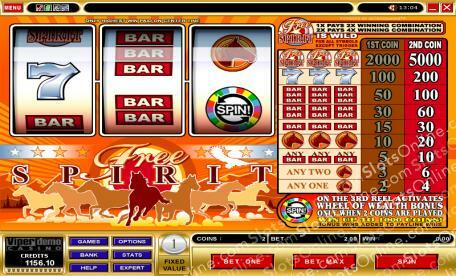 As a 3-reel slots game, Free Spirit is easy to play. There is only a single payline, and up to 2 coins can be played at once. The fixed coin value keeps things simple, so the only decision to be made is whether to play the minimum 1 coin bet for a poorer payout and no bonus game opportunity, or the maximum bet to activate the 5000 coin top prize combination as well as adding the possibility of the Wheel of Wealth minigame. If you long to be free of the shackles of work and home life, then the Free Spirit Wheel of Wealth slots will appeal to the wild stallion within you. The Free Spirit Logo symbol is wild in this game, and it can substitute for any symbol other than the bonus symbol. Also, it increases prize payouts when acting as a substitute. When 1 wild symbol substitutes, the prize is doubled. The prize is quadrupled when 2 wild symbols act as substitutes. The Wheel of Wealth symbol on the third reel activates the bonus. In this bonus game, the Wheel of Wealth is spun and when it stops, the player is awarded the prize amount that the arrow points to. Autoplay can be set for up to 500 spins. It may also be set to stop when a jackpot is won, a bonus is triggered, on any win, on a win of a certain amount, or if credits increase or decrease by a certain amount.